Canada’s black market from the shadows into the light. The life blood of Smiths Fall, the old Hershey’s Kisses factory closed its doors and moved to Mexico in 2007. The closing of the factory was hard on the local area. For more than 40 years, this rural community held the title of the ‘Chocolate capital of Ontario’. Now the dilapidated building has weeds growing through the cracks of the carpark pavement. The old Hershey’s factory, desolate, and abandoned to the naked eye. What does it hide inside? Out of the shadows of desertion, into the light of a new life – for the building and the community. Its shabby exterior hides what now has become home to Canopy Growth Corporation with its medical cannabis brand Tweed. Instead of producing chocolate kisses, these days its products have names like Lemon Skunk. Canopy Growth has breathed new life and hope into the community. Entering the building is like something from a sci-fi movie. Tight security, with cameras, checkpoints, and bolted, locked doors to pass through before arriving at the factory entrance. Here you face a cold steel door only accessible with a staff swipe pass and a thumb scan across a biometric scanner. Once through the factory’s outer layer, visitors face more security checkpoints. Visitors cannot access different parts of the factory without coming across closed doors. Like the set of stainless steel doors built to withstand an explosion, that protect a store of finished product worth $150 million plus. Canopy Growth takes no chances when it comes to security. 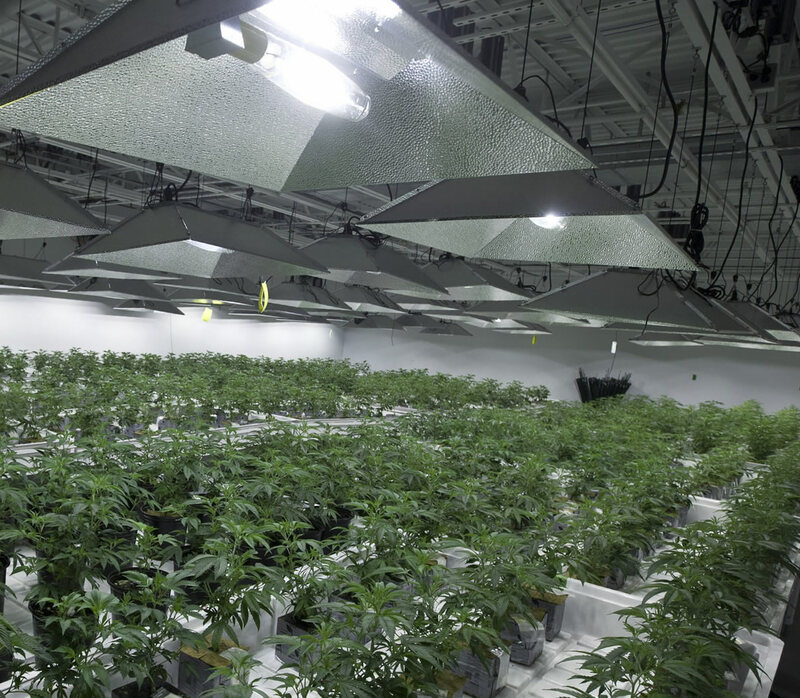 Access into climate-controlled flowering rooms is tightly controlled. Huge buds grow from hundreds of plants in a place few staff have access. During flowering cannabis plants are vulnerable to disease. Climate-controlled flowering rooms minimise possible contamination. Staff dress in white sterile coveralls with hair held in place with hairnets. They must sanitise their hands-on entry. Tweed’s Adam Greenblatt says it is the sanitary conditions their medical cannabis is grown in that gives them the edge over cannabis grown on the black market. Since late 2016, Canopy has bought out rival businesses in Quebec and Toronto in deals worth more than $430 million. Currently Canopy is worth a cool $1.6 billion. Canada’s most profitable cannabis business. Canopy shares are up $3 from the middle of 2016 to $12.69 on the Toronto Stock Exchange. Canopy is in an all-out race with competitors like Aphria and Aurora Cannabis. They are throwing huge amounts of money at projects to grow large amounts of cannabis. Canopy Founder and CEO Bruce Linton recently announced they were trebling their production. Canopy is now launching into the Quebec market with the purchase of a 90-acre farm outside Drummondville. In 2016, Greenblatt, left his position as executive director at Santé Cannabis. The leading medical cannabis clinic in Quebec he founded. He is now head of Quebec engagement at Tweed, a Canopy subsidiary. With rapid expansion into Quebec, Greenblatt’s appointment is about driving patient access to legal medical cannabis. This fits his role of a lifetime campaigner for legalised cannabis. Greenblatt’s passion to fight for medical cannabis began when, at 18, he was in trouble at school over cannabis. His father had multiple sclerosis and had run out of options accessing cannabis. Greenblatt was filling his father’s prescription. The hypocrisy of getting in trouble for picking up a prescription for his father fuelled his passion. Greenblatt created Santé Cannabis in 2014 when Quebec legalised medical cannabis. This became Quebec’s first full service medical cannabis clinic. Though the centre does not dispense on site, they provide access to physicians sympathetic with patients’ need to access medical marijuana. Getting access is one of the biggest hurdles patients face. At the time, the College des Medecins du Quebec wanted to ban prescriptions for medical cannabis until they told this was ‘unconstitutional’. Greenblatt’s new role at Tweed is an expansion of his vision to give people access to the medical cannabis they need. It will allow him to engage medical professionals and patients to build a professional, innovative cannabis industry in Quebec. One of Greenblatt’s strengths at Santé Cannabis was his ability to influence policies for positive outcomes for Quebec. This helps patients get safe, legal access to medical cannabis under the Marihuana for Medical Purposes Regulations. Greenblatt’s role at Tweed allows this crusader to further empower the people of Quebec, where it is harder for patients to access medical cannabis than in other parts of the country. Greenblatt meets with Quebec’s business community to grow support for Tweed’s products. While, simultaneously, trying to encourage patients using the local underground medical cannabis system out of the shadows into the light of a legal system. Quebec is a new market with the highest rate of cannabis use in the country but the lowest rate of participation in the legal system. According to Health Canada there are 100,000 patients buying medical cannabis through its system, with only 3000 registered in Quebec. Quebec s also underrepresented with licensed producers with only one out of 38 in the state. Greenblatt knows the black market. He makes it no secret. He has been there and proud of his roots and the ability to fight for patients’ rights, and continue that working with Canopy. In fact, many of Canopy’s employees have come from the shadows. It makes sense. They have the expertise. It is not really like you will find cannabis experts just anywhere in the community. Only a fifth of more of 500,000 medical cannabis users participate in the program which requires patients to get their cannabis in the mail from a licenced grower. But, most patients see no real incentive to use the legal system. They already grow or buy cannabis through illegal storefronts. There is no real incentive to buy through the legal framework when public and private insurance does not cover the cost. With black market and legal prices on par there is not much point. The government scheme has trouble with supply and demand. And, then there are the hold ups and disputes using Canada’s postal system that delays delivery to patients. Hardly an ideal situation for those waiting for their medication. Dispensaries thrive in urban areas. Founder of the first dispensary system in Montreal in 2000, Marc-Boris St-Maurice, believes many patients have a connection to a local dispensary in place long before the government system. St-Maurice was arrested and fought for the right for patients to have legal access to medical cannabis. The new Health Canada program allowing patients to deal directly with licenced cannabis suppliers has meant to sideline dispensaries. While Health Canada tripled the number of patients enrolled, the black market is still where many patients source medical cannabis. The most obvious reason is it is the easiest way. Government is competing against a well organised underground system run by bikers. It is efficient with regulated prices, has a limitless supply and distribution networks that reach all corners of Canada. Everyone knows someone they can contact. Getting a government cannabis prescription filled can be too hard. Canopy’s sights are not just set on the medical cannabis market. Its current frenetic growth outstrips medical demand. But, it is not just medical cannabis Canopy has in its sights. It I is gearing up for a legal, Canadian recreational cannabis market. The government is set to introduce recreational cannabis legalisation this year. Though, it may not come into effect until 2018. According to Deloitte research, it predicts the market is worth upwards of $22 billion a year. Canopy’s huge infrastructure investments means it can grow a new crop in around 4 months. This includes testing for contaminants and potency. As well as passing Health Canada’s regular inspections. Canopy came from being a small startup a few years ago to building an impressive physical infrastructure. It employs 170 workers including factory staff, lab technicians and a ‘master cannabis grower’. It has two call centres at the Smiths Falls site, a 350,000-square-foot greenhouse in Niagara, testing laboratory in Toronto and 29,000 registered patients using its products. It could be Canopy’s focus on its end goal that sees it survive the ‘green rush’. Licenced medical cannabis producers were first listed on the Toronto Stock Exchange in 2013. Since then, the top most valuable cannabis stocks are worth $3 billion. BCMI Report editor and market analyst, Chris Damas, believes there are so many unknowns in the cannabis industry but there may soon be too much supply for the medical market. his could drive medical cannabis prices down. As soon as the recreational market opens that could change. It could be enough to put half the current cannabis producers out of business. Only the next few years will see who survives the cannabis race to the finish. Dumas predicts Canopy, Aurora and Aphira along with others combined, will increase cannabis production by 240 tonnes over the next 3 years. Companies are clearly gearing up ready to meet the recreational market when Canada legalises cannabis.